How do i catch them? what size hook do i use and bait? rig? Used to catch heaps of mullet from lagoon pier in the shallows. Burley up small hooks paternoster or used to catch them with a float as well. Bait used was chicken. 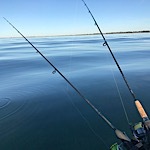 best hooks i find to catch mullet are size 10 or 12 long shanks baited with a small piece of bread or a small piece of squid for something more durable. Usually I use little to no weight. If they're really aggressive you can catch them on small poppers. Good luck! I been to that store, and I like the guy there. Great service and help.